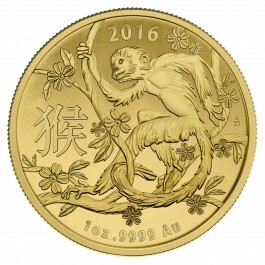 This stunning 2016 1 oz Year of the Monkey Australia Lunar Coin commemorates the year of the Monkey in the Chinese Zodiac and is part of Royal Australian Mint's Australian Lunar Series. Struck in 99.99% fine gold. The contrast of the matte and proof like finish of images on the lunar series are what catch the eye of collectors and investors alike.